LEGENDARY SURFERS: BUZZY TRENT, R.I.P. Buzzy's son wrote me, today (9/28/2006), to say that his father left us on September 27th. progress. I will list them here and update in the weeks ahead. growing up in HI, the lat 50's I was 12 and such a stoked surfer. home. Buzzy was obviously our #1 big wave hero in the early days. was Buzzy who always seemed like the crazy charger. bring him in it would be Buzzy. I met him in 1973 while I was living at Velzyland and had the great fortune to meet his brother John, when I went to Alaska in July 1975 for the Bicentennial. I was stationed aboard the USS Monticello (LSD-35) and the people of Anchorage had a "Host a Sailor" program for the 4th of July celebration there. John Trent picked my name because my "Bio" included the fact that I was a big wave surfer who had just come from the "dream" duty station of NAVCOMSTA, Honolulu (Wahiawa). What John did not know from my "Bio" was that his brother was one of my heroes as a young gremmie. I spent a delightful day with John and his wife and I would really appreciate any information you have regarding funeral arrangements and if John, (if he's alive), will be attending. Please reply as soon as you have an opportunity. Thanks for your assistance in advance. Buzzy Trent was a fearless adventurer who fought bulls in Tijuana and boxed before gaining fame as one of the legendary pioneers of big-wave surfing. "Buzzy took on challenges that stimulated his adrenaline in sports that most would be hesitant to take on, primarily surfing and hang-gliding," said friend George Downing, himself a renowned waterman. "When he was asked to take on a challenge, his answer was when, not where." Goodwin Murray "Buzzy" Trent Jr. died Sept. 6 at Hale Ho Aloha nursing home in Pacific Heights. He was 77. 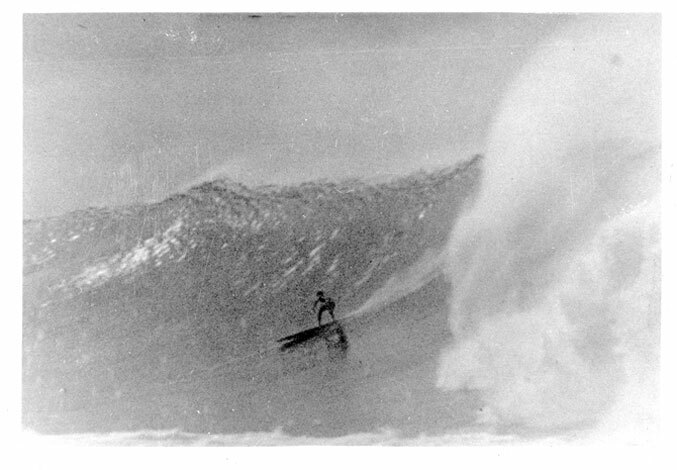 A California native, Trent gained international note in 1953 when the late Scoop Suzuki photographed him with Woody Brown and Downing riding a 20-foot winter wave at Makaha in the first widely published photos of big-wave surfing. Peter Cole of Sunset Beach said Trent, his lifelong friend from grammar school in Santa Monica, Calif., was an exceptional athlete who could run 100 yards in 10 seconds in high school. Trent was an all-state football player whose career was cut short at the University of Southern California by a leg injury suffered in practice, Cole said. 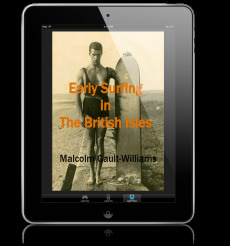 Trent, one of the top young surfers in California, sailed to Hawai'i on a catamaran in 1953 after hearing about big-wave surfing at Makaha from a friend, Walter Hoffman. "Buzzy loved to surf Point Break Makaha," Downing said. "He enjoyed sliding across these long breaking waves and considered Jan. 12, 1958, as one of the greatest surfing days of his life." Downing described the winter waves that day as perfect. "It was gigantic, 25 to 40 feet," he recalled. "At the end of the day, Buzzy said to me, 'My life is now complete.' "
Trent and Downing were in a class by themselves, the first big-wave masters of Makaha, said author and former surfing champion Richard "Ricky" Grigg. "George had the ocean knowledge, he was the general, and Buzzy had the guts to lead the charge," said Grigg, a University of Hawai'i professor of oceanography. "Together, they formed a great team that conquered big waves." Grigg said Trent was known for his power and high trim and had the willpower, stamina and true grit to take wipeouts head on. Five-time tow-in surfing champion Garrett McNamara said of Trent: "He was among the pioneers who did it with no leash and giant boards. They did it for the love of it and challenge. Hats off to them." Despite his tough-guy appearance and private nature, Cole and other friends often saw another side of Trent. "He was a model physical specimen and also an entertaining individual with a lot of charisma," Cole said. "I remember once we were in lineup (waiting for waves) at Laniakea, and he starts telling stories. We're all listening and not moving. He keeps talking while moving away and this wave comes in. He gets the wave, and we all get caught inside." Grigg said Trent took up hang- gliding while it was still a relatively new activity. Wearing only shorts, Trent once hiked up the slopes in Wai'anae to hang-glide and was blown several thousand feet high. "He almost froze to death," Grigg said. Trent was a big part of his life, Grigg said. At age 11 while surfing with Trent at Santa Monica, Grigg was speared by his surfboard. "It split my spleen in half and he rushed me to the hospital," Grigg recalled. "He saved my life. "I've been his mascot for a long time, and he was like a surrogate father to me," Grigg added. "He had the most influence of anyone on my life. He always used to tell me, 'If you're out surfing, take risks, but calculate it first and then go for it.' "
Goodwin Murray Trent Jr. was born in San Diego and raised in Santa Monica. His grandfather, John Parkinson, was a Los Angeles architect who designed several of the city's historical landmarks, among them the Los Angeles Coliseum, City Hall and University of Southern California campus. Trent is survived by his second wife, Gladis; daughter Anna and son Trent; and seven grandchildren. Private services have been held and his ashes scattered at sea. Reach Rod Ohira at rohira@honoluluadvertiser.com. Traveling over miles and miles, across the vast Pacific Ocean. North/ North Westerly direction. Until reaching the Leeward Coast of Waianae,Oahu - to the World renown spot, Makaha Surfing Beach. These Blue Water Mountains came rolling through/ Winter after winter. Touched by very few surfers, back in the early 50's. Few men had tamed these Blue Water Mountains. Bringing Grown Men, closer to God, in her fury. Buzzy Trent, along with a crew of these Mountainous Wave Slayers, had done just so. Buzzy as I was told by son - Ivan Trent, who introduced me to, Point Makaha in the early 70's, as kids. Spoke of his Pops - the surfing, diving and hang-gliding endeavors, that his Pops, had done. Ivan Trent showed me a genuine invitation of a Duke Kahanmoku, surf contest. As a young surfer, to see that invitation, was a Honor in it self. Buzzy was not the contest type, but a man who measured courage through his actions in and out of the water. Going to the movie, at a theater in Kaimuki, with friend Ivan Trent and a couple of complimentary tickets/to watch, Going Surfing, Filmed and Directed by Bud BROWNE - (Buzzys good/ old time friend). And to see footage of Buzzy Trent was - Legendary in it self. He was everthing son, Ivan Trent had described. He was humerous, funny, talkative/ a take control type of guy. Buzzy was the True Slayer of those, Blue Water Mountains. As told by friend and son, Ivan Trent. I will take a trip out to Makaha, this winter and reflect on both Father and Son (friend)and catch a few. . .and watch the sun set, as I did growing up, on the West Side, all my young life. Ivan Trent as I know still, surfs huge waves. He is also a chip off the old man, putting it tastefully. He is an Elite Navy Seal, "UHHH RAHHH, MY FRIEND"
I would like to take this time to offer my condolences to Ivan and his entire family. There are no words that can decribe your lost, my friend. But there are words that will continue to describe his Legendary, Life. I lived next door to Buzzy and his wife and son on Macau Street Makaha in 1961. I was also his paper boy and delivered the Honolulu Advertiser to his house. I was 16 and a student at Waianae High School. He drove a 40 Ford convertible. Always smiling and friendly. It wasn't until a year or so later after I took up surfing that I realized who he was. A great surfer and human being.